LAFAYETTE, IN--(Marketwired - Dec 10, 2013) - Wabash National Corporation (NYSE: WNC) today announced its Commercial Trailer Products group has produced its 500,000th DuraPlate® van trailer. 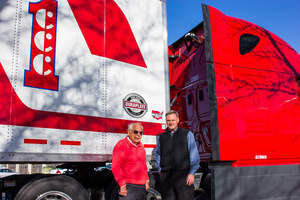 The company's 500,000th DuraPlate trailer was built for Crete Carrier Corporation, one of the largest privately owned trucking companies in the United States. "Wabash has always led the industry in innovation, going back to the early plate trailer that revolutionized the design and construction of traditional sheet and post trailers," said Tonn Ostergard, chief executive officer and president of Crete Carrier Corporation. "The DuraPlate van provides maximum cube space, which helps us serve our customers, and the smooth interior walls reduce cargo damage. The durability of the DuraPlate van provides us with a quality asset with a low total cost of ownership and a solid residual value at time of sale or trade." "Reaching this milestone of building half a million DuraPlate dry vans is a significant accomplishment for our associates and our customers," said Brent Yeagy, group president of Commercial Trailer Products at Wabash National. "It is further evidence of how customers, both large and small fleets alike, value the durability, longevity and low total cost of ownership provided by our line of American-made DuraPlate vans." Wabash Commercial Trailer Products is the leading producer of semi-trailers in North America. Since 1985 the business has revolutionized the trailer industry, building a legacy of innovation that has been recognized with more than 70 patents. From a full line of dry vans to refrigerated vans, intermodal equipment, and platform trailers, Wabash Commercial Trailer Products sets new standards in design and performance. Learn more at www.wabash-trailers.com. Headquartered in Lafayette, Ind., Wabash National Corporation (NYSE: WNC) is a diversified industrial manufacturer and North America's leading producer of semi trailers and liquid transportation systems. Established in 1985, the company specializes in the design and production of dry freight vans, refrigerated vans, platform trailers, intermodal equipment, liquid tank trailers, frac tanks, engineered products, and composite products. Wabash National's operations are largely organized under three wholly owned subsidiaries: Transcraft Corporation, Walker Group Holdings LLC and Wabash National Trailer Centers, Inc. Its innovative products are sold under the following brand names: Wabash National®, Transcraft®, Benson®, DuraPlate®, ArcticLite®, Walker Transport, Walker Stainless Equipment, Walker Defense Group, Walker Barrier Systems, Walker Engineered Products, Brenner® Tank, Beall ®, Garsite, Progress Tank, TST®, Bulk Tank International and Extract Technology®. Visit www.wabashnational.com to learn more. Crete Carrier Corporation's Chairman Duane Acklie and President and Chief Executive Officer Tonn Ostergard receive Wabash National Corporation's 500,000th DuraPlate van trailer in December 2013.